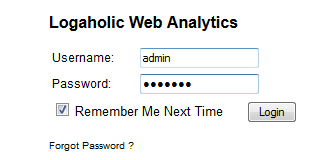 After installing your Logaholic stats program, you will want to know how to log into it for the first time. This article explains how to do that. When you installed logaholic, you likely entered a directory name where it was installed. This name will be part of the URL you need to access the Logaholic login screen. For example, if you named the directory 'stats' and your domain name is 'example.com', then you would enter 'example.com/stats' to find the Logaholic login screen. Once you enter the URL into your browser, then you will see a login screen. From there, enter your Logaholic admin user name and password, then press the Login button.